According to a new market report published by Transparency Market Research titled “Natural Ingredient Insect Repellent Market –Global Industry Analysis, Size, Share, Growth, Trends, and Forecast, 2018 – 2026,” the global natural ingredient insect repellent market is expected to reach a value of US$ 2,502.5 Mn by 2026. The market is estimated to expand at a CAGR of 6.3% during the forecast period from 2018 to 2026. In terms of volume, the market stood at around 207.2 Million Units in 2017. North America dominated the natural ingredient insect repellent market in 2017, acquiring approximately 32% of market share. The market in this region witnessed increased awareness about safe and healthy insect repellents containing plant based extracts. Additionally, extensive R&D investment for development of strong and efficient natural insect repellents is anticipated to drive the natural insect repellent market in the region. 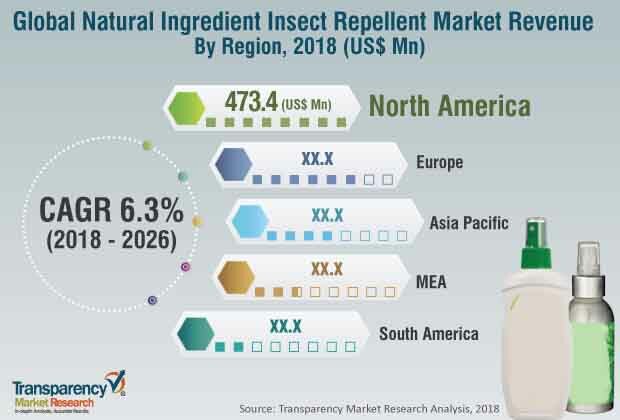 The natural ingredient insect repellent market is influenced by market dynamics with the prime driving factor being increasing health awareness. Increase in health awareness amongst both theurban and rural population across the globe is boosting the natural ingredient insect repellent market. Furthermore, increase in outdoor recreational activities is increasing the demand for sprays/aerosols, essential oils etc. as they are easy to handle and carry, and can be applied as and when required. Based on product type, the sprays or aerosols segment dominated the market in 2017 and was valued at US$ 456.1 Mnat a CAGR of 6.8% due to its widespread application across the globe. Sprays and aerosols are compact in size and easy to handle and carrywhile on the go. Based on ingredient type, oil of lemon eucalyptus acquired major market share due to its efficiency compared to other natural ingredients. Oil of lemon eucalyptus is less volatile and does not evaporate quickly once applied compared to other natural ingredients. According to pest targeted, the mosquitoes segment acquired major share in the market due to increase in mosquito borne disease. According to distribution channel, the online channel is anticipated to expand at a faster rate due to availability of numerous products at a reasonable rate. Some of the key players in the natural ingredient insect repellent market include Reckitt Benckiser Group PLC, Godrej Consumer Products Ltd., S.C. Johnson & Son, Inc., Spectrum Brands Holdings Inc., Honasa Consumer Pvt Ltd., First Step Digital Pvt Ltd., Quantum, Inc., Dabur International, Enesis Group, and Homes LLC.The key players adopt numerous strategies to sustain in the market. Product development and acquisition and partnership are some of the main strategies adopted by key players to gain a competitive edge.